Last year, Donald Trump said that Saudi Arabia wants “women as slaves and to kill gays” — and suggested that the kingdom had ordered the 9/11 attacks. The mogul reiterated this (not entirely baseless) charge on the stump, while arguing that Saudi Arabia was taking advantage of America financially — even though their monarchy “wouldn’t exist very long” without Washington’s aid. When the candidate wasn’t painting Saudi Arabia as a tyrannical, terroristic parasite, he was, quite often, describing its faith as a malignant virus threatening the survival of Western civilization. The Republican standard-bearer announced that “Islam hates us”; called for banning all of the world’s 1.6 billion Muslims from entering the United States; and repeatedly cited the mass murder of Muslim prisoners of war with bullets dripped in pig’s blood as an inspiration for his counterterrorism policy. After eight years under Barack Hussein Obama — a man who refused to so much as say the words “radical Islamic terrorism” — American Islamphobes greeted Trump’s election with euphoric relief. And so did the Saudi royal family. 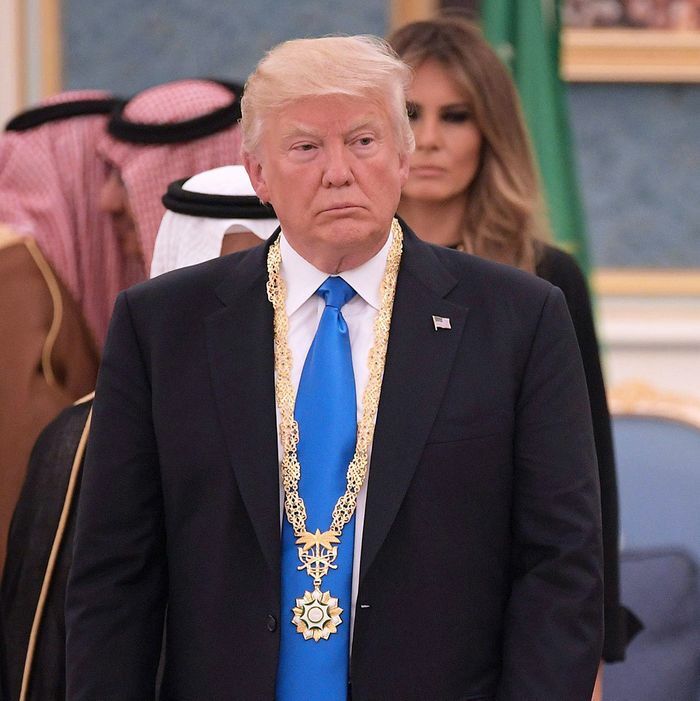 In Riyadh, Mr. Trump is viewed as a refreshing change from President Barack Obama, who was viewed with disdain in the wake of the Iranian nuclear deal that Mr. Obama brokered in 2015. Last year, Mr. Obama visited Saudi Arabia for meetings with King Salman and Gulf leaders, but the king did not meet him on the airport’s tarmac. Mr. Obama’s aides later played down the incident, but it was broadly portrayed in news accounts as a snub. Mr. Trump’s planned trip had been greeted with public enthusiasm that is rare for this usually restrained country. Huge billboards around the city featured Mr. Trump and King Salman, while the city’s roads were lined with alternating American and Saudi flags. 1) Saudi Arabia cares more about retaining the United States as a dogged ally in its conflicts with Iran than it does about combating the rise of anti-Muslim bigotry. 2) Donald Trump cares more about his hotel interests on the peninsula than about combatting the oppression of women who live under authoritarian theocracies. Once you get past his theories about 9/11 and the nature of Islam, Trump is close to the ideal American leader, from the Saudi perspective. The president has evinced more respect for dictatorial strength than human rights; views foreign policy in transactional terms; places a premium on loyalty; surrounds himself with fanatically anti-Tehran generals; and appears deeply susceptible to manipulation through flattery. But absent a credible plan for forcing regime change in Syria — an ambition that many believe would require an American ground invasion of the country — the strike risks merely escalating and prolonging a civil war that the Assad regime remains well-positioned to win. Nonetheless, the strike will lend credibility to the denunciations of Tehran that Trump will offer in his speech in Riyadh tomorrow. “All nations of conscience in the Middle East must work together to roll back Iran’s destabilizing influence, restore a more stable balance of power in the region, and pray for the day when the Iranian people have the just and responsible government they deserve,” reads one leaked draft of the speech, obtained by the Associated Press. That draft offers implicit assurances that no one need pray for the women of Saudi Arabia to have the “just and responsible government” they deserve: “We are not here to lecture — to tell other peoples how to live, what to do or who to be,” Trump says in the leaked draft. Notably, Iran’s reformist president, Hassan Rouhani, won reelection Saturday on a promise to combat extremism and expand individual freedoms. But “responsible governments” and “destabilizing influences” are in the eye of the beholder. Saudi Arabia has spent tens of millions of dollars exporting its brand of puritanical Islam throughout the Muslim world. And the kingdom is currently using U.S.-made planes and bombs to prevent food aid from entering Yemen, thereby engineering a hunger crisis that threatens the lives of millions. On Saturday, the White House announced a new arms agreement with the Saudis, which will provide the kingdom with $350 billion in U.S. weapons over ten years.